I'm so SO excited to host my first ever Sunday Street Team post this month. This month's Sunday Street Team book is Tara Sim's BEAUTIFUL debut novel - Timekeeper. I haven’t read a steampunk novel in FOREVER. So much so, that I remember that the last time I was reviewing a steampunk novel, I remember saying the EXACT same thing! 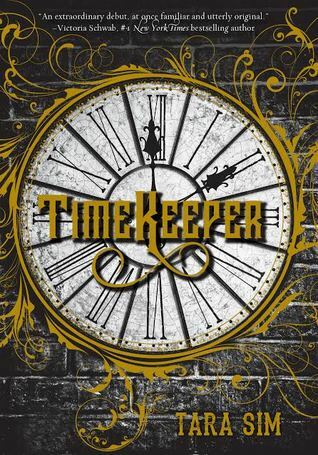 In Short, Timekeeper was an interesting, slow-paced and romantic read that had me hooked from start to finish. Daniel Hart is the youngest mechanic who has ever been inducted into the Mechanic’s Union. Set in 17th century London, Clocks around the world connect with each other to give the world Time. Without the clocks, the world will be stuck in an endless time loop, repeating the same minute over and over again for eternity. Three years ago, the city of Maldon Stopped. For three years, its citizens have lived in a time loop, not aging, unable to leave the city limits, reliving a minute at a time. And Daniel Hart’s father is one of those people. With a mother that blames him for his father’s entrapment, a strange apprentice in the clock tower that has Danny thinking about more romantic things than fixing gears, and attacks on clock towers everywhere, there is no more dangerous time than now for a mechanic to fall in love. Timekeeper was such a DIFFERENT story. I adored the romance between Danny and Colton/ Brandon. It was a young, forbidden romance, with both of them constantly figuring out how they could work despite all the things working against them. I loved that the Mechanic’s Union had such a great part in this, including the other Mechanics like Matthias, Lucas and Daphne. I ADORED Danny’s best friend, Cassie, with her normal car mechanic skills and sound advice, romantic or otherwise. The dialogue was slightly awkward in the last few scenes, especially during the reunion of a certain few people. Moreover, there were all these POV changes to THE GODS (?) that were strange. I can only imagine that they will be making an appearance in the next few books, but it was still so strange to switch from steampunk 1800’s London to a God’s Story, even if it was about Time. All in all, I would DEFINITELY recommend Timekeeper for a different, romantic read! What was the last Steampunk Novel that you read? What was the last LGBTQIA Book you read?